The funeral for Chicago blues great Hubert Sumlin, the longtime guitar player for Howlin' Wolf who died Sunday at age 80, will be paid for by Mick Jagger and Keith Richards of the Rolling Stones. Sumlin's partner, Toni Ann, posted the news online. "God bless the Rolling Stones," she wrote. See the RollingStone.com story Mick Jagger and Keith Richards Will Pay Hubert Sumlin's Funeral Expenses. Rod Stewart will be ready for a possible Faces reunion, when the Faces including Ronnie Wood will be inducted into the Rock and Roll Hall of Fame next year. Se the RollingStone.com story Rod Stewart: 'I'll Definitely Make Myself Available' for a Faces Reunion and fans discussing the subject in The Small Faces / The Faces to Rock'n Roll Hall of fame. Paul McCartney teamed up with Ronnie Wood during his gig at London's O2 Arena last night (December 5). Ronnie gest played on the Beatles' 1969 classic "Get Back". See the NME report Paul McCartney joined onstage by The Rolling Stones' Ronnie Wood in London and IORR members reporting from the show Ronnie plays with Macca in London. The Some Girls rerelease in Japan will feature an extra bonus track "So Young" (Piano Version) on CD-2 #13. The Japanese Deluxe Edition release date is Dec. 7, and the Super Deluxe Edition is due Dec. 14. See The Japanese Deluxe Edition by Universal Japan. 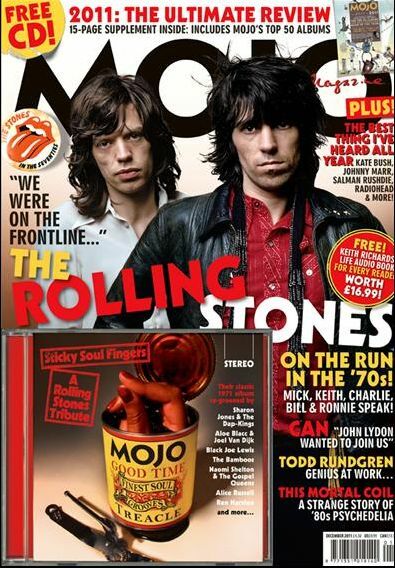 This month's MOJO magazine, due out next week, has got Mick and Keith on the cover, and inside brand new interviews with Mick Jagger, Keith Richards, Charlie Watts, Bill Wyman and Ronnie Wood, concluding with a detailed look at Some Girls, featuring unseen shots by fashion photography legend Helmut Newton. See Some Girls by MOJO magazine. Mick Jagger and Keith Richards will meet in December to decide how the Rolling Stones will celebrate next year's 50th anniversary. There are rumours about Bill Wyman and Mick Taylor, and also of various concepts with less travel and a tour with more breaks in time. See the Stones Near Decision on 50th Anniversary Shows story by RollingStone.com. Mick Jagger and Keith Richards talk to Associated Press about "Some Girls" and the tracks on the reissue album. See the story Mick Jagger and Keith Richards on "Some Girls" reissue and the bands upcoming 50th anniversary. The Ben Waters Band (without Charlie) played the Bull�s Head Barnes on Monday 14 November. 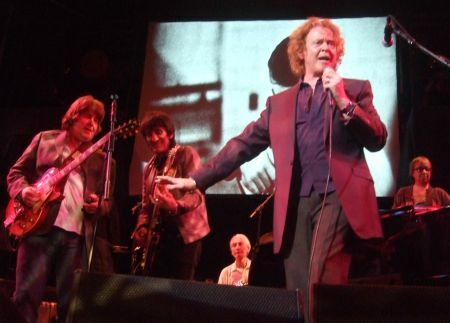 Just before the half-time break, Ronnie jumped on stage to join the band for "Worried Life Blues" and "Little Queenie". See the video Ben Waters Band & Ronnie Wood - Worried Life Blues on Youtube. The Rolling Stones have just launced the site Stonesarchive.com, where fans can buy or get access to rare music and memorabilia. See the official RollingStones.com announcement The Rolling Stones launch StonesArchive.com and release The Brussels Affair worldwide. Google Music will offer six never before released concerts by the Rolling Stones, including Brussels '73. For more info see the IORR thread Google Music to offer six unreleased Stones concerts. Nov 12: New book "Treasures of the Rolling Stones"
Carlton Books are publishing the new book "Treasures of the Rolling Stones" by Glenn Crouch. The book includes reproductions of rare souvenirs from the private collection of Rolling Stones fan Matt Lee, like a postcard from Mick Jagger to the record company, a letter to a fan from Brian Jones and more. See Rolling Stones Treasures by Carlton. Universal International Music have kindly donated five copies of the SuperHeavy CD for IORR visitors. See the IORR thread SuperHeavy CD giveaway by IORR. Keith Richards is going into studio in London with Charlie Watts and Ronnie Wood later this month. Quote from Keith: "That's a good start: me, Charlie and Ronnie. Mick's welcome, and I'm sure he'll turn up, but right now we just want to get our chops down." See the story Rolling Stones Plan London Jam Session by RollingStone.com and talk about the news in the IORR thread Stones to jam in studio this month. The New York Post reports that former U.S. President Bill Clinton will present Keith with the Mailer Prize for Distinguished Biography in New York City on November 8, 2011. Then Keith will also be receiving an award at the "Keeping the Blues alive" awards in Memphis Februar 4, 2012. "No Spare Parts" will be released on 7" vinyl Friday Nov. 25. A digital version will be available during the week of Nov 14. The song tells the story of a trip from Los Angeles to San Antonio, See the "Some Girls" and "No Spare Parts" details by IORR. Universal Music UK have issued a press release with details of the bonus tracks of the Some Girls reissue due out Nov 21. See the IORR pages Some Girls - The Rolling Stones 2011 reissue. 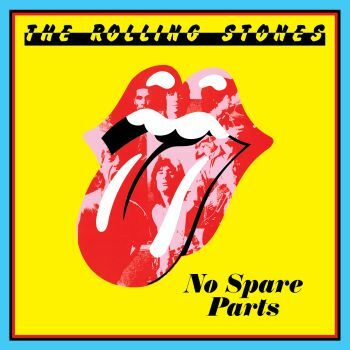 Today Rolling Stones fans will get access to the world exclusive first play of "No Spare Parts", one of the twelve previously unreleased tracks featured on the second disc of the forthcoming deluxe edition of Some Girls. See broadcasting details and more on 'No Spare Parts' world exclusive first play! by Universal. HBO is working on plans for a new series about a fictional record executive in the late Seventies being developed by Mick Jagger, Martin Scorcese and Boardwalk Empire creator Terence Winter. See the story HBO Considering Jagger-Scorcese Project by RollingStone.com. Keith Richards is guest on the new Tom Waits album "Bad As Me" due out October 24. Keith lends his guitar work to three tracks on the album: "Chicago", "Satisfied" and "Hell Broke Luce", and adds both vocals and guitar to "Last Leaf". Quote from Tom Waits: "I was really nervous. He [Keith] came with about 600 guitars in a semi-truck. And a butler. I was really knocked out that he played on all those things.� See the stories Tom Waits: �Songs are pretty easy� by NME.com and Keith On Tom Waits' New Album by KeithRichards.com. There will be a separate CD with unreleased songs on the "Some Girls" rerelease due out November 21. 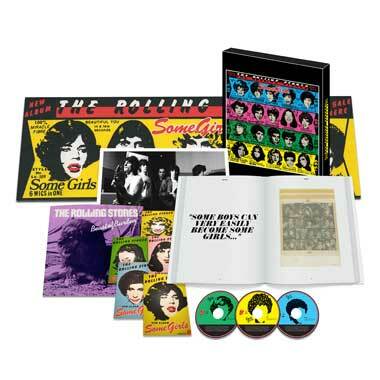 See the Some Girls track list revealed by RollingStones.com. The ABCD of Boogie Woogie fealturing Charlie Watts have added a show on Oct 31 at the Kaufleuten, Zurich Switzerland. See Charlie Watts tour dates by Rosebud. Mick Jagger has been doing interviews with selected press in London this week. See track listings and more by ultimateclassicrock.com, a 17-minute interview in English by ZDF where Mick says there are no tour plans for The Rolling Stones at the moment, and a shorter video clip by BBC. The Rolling Stones have announced the release on November 21, 2011 of the re-mastered, expanded, Super-Deluxe, Deluxe and Digital editions of the 1978 album "Some Girls". See the RollingStones.com announcement Some Girls to be released this November. 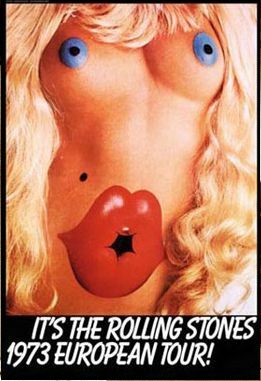 A movie and a DVD featuring 85 minutes live from The Rolling Stones live at the Will Rogers Memorial Center in Fort Worth, Texas, on 18 July 1978 has just been announced by RollingStones.com. Bonus material features a newly filmed interview with Mick Jagger. See Some Girls: The Rolling Stones - Live in Texas" Screening in cinemas worldwide from 4 October 2011 and Some Girls - Live in Texas - to screen in cinemas. Mick, Keith, Charlie and Ronnie met up in London, UK yesterday Wednesday September 7. The agenda was set for the plans of The Rolling Stones during the next year or so. As soon as we get info from this meeting you will be told here. For photos and comments see the Daily Mail report A tour in the pipeline? Rolling Stones make rare appearance together sparking rumours of a new project and fans discussing the meeting in the IORR thread The Rolling Stones meeting in London. The Japanese release of the SuperHeavy album has got one extra track. "Never Gonna Change" (Acoustic Version). See album art and track details on the Universal Japan web site. Also, the "Miracle Worker" CD single will be released in India (only), not in Japan. Keith Richards has helped save a tiny radio station hit by lightning. Keith legend sent a �3,000 cheque to repair Angel Radio's transmitter, knocked out by the strike in July. The station broadcasts pre-1969 music on the Isle of Wight. See Radio station is saved by �3,000 from Rolling Stone Keith Richards by The SUN. The Rolling Stones' performances on "The Ed Sullivan Show" are being released on two DVDs. "4 Ed Sullivan Shows Starring the Rolling Stones" goes on sale in the U.S. and Canada on October 4, 2011. "6 Ed Sullivan Shows Starring the Rolling Stones" goes on sale in the U.S. and Canada on November 1, 2011. Both DVDs are being released by Sofa Entertainment and distributed by Universal Music. See details in the story Rolling Stones' 'Ed Sullivan Show' appearances get two DVD releases in fall 2011 by Examiner.com. 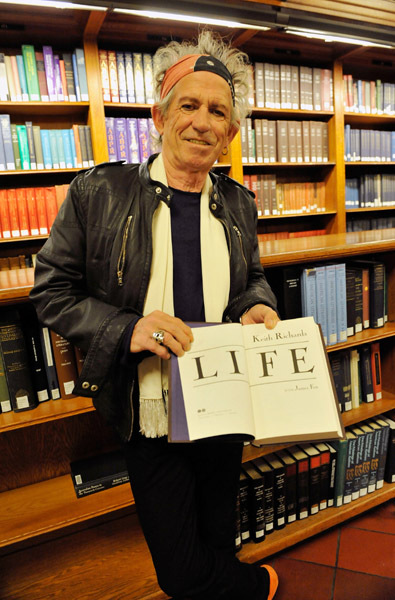 Keith Richards has written one of the biggest selling rock books ever. His memoir book "Life" has sold over one million copies since its release last year, equivalent to going platinum in the music world. See the RollingStone.com story Keith Richards' Memoir Sells a Million Copies. Brad Paisley surprised his full-house audience at London's O2 Arena on Wednesday August 17 when he brought out special surprise guest Ronnie Wood during the encore. They performed "Let the Good Times Roll" and Brad's hit "Alcohol" with a little help from Darius Rucker. See Brad Paisley Rocks Alongside Rolling Stones� Ronnie Wood in London by tasteofcountry.com and the IORR thread Ronnie Wood and Brad Paisley on stage in London. This is what Rolling Stone magazine says about "Miracle Worker": "Jagger really goes for it, tasting every word he rolls out over the soul-splashed roots-reggae groove, which is cut with a gorgeous fiddle melody strung between Nashville and Istanbul. It's a summertime single built for every beach." See the story Editor's Pick : Superheavy, 'Miracle Worker' by RollingStone.com. Dave Stewart spoke to BBC One programme The Andrew Marr Show about his SuperHeavy group with Mick Jagger, explaining that �it�s a whole fusion of different styles � Damian Marley�s Jamaican, AR Rahman is Indian and Mick�s from England, so am I, and Joss is from Devon�. He added that �some of the first songs were an hour long, (so) we had to edit them down�, and �we wrote about 30 songs and then we brought it back down to 16 and the album�s out in September�. See the story Mick Jagger recorded hour-long songs with supergroup. The Ronnie Wood Show will launch in February 2012 on Sky Arts. Comments from Ronnie: "I've had so much fun doing my radio show and had lots of success with recent awards. It's now going to TV to give the audience the chance to see behind the scenes." Charlie Watts has announced another show in France with the ABCD of boogie woogie. The day after the Paris show there will be a show on Oct 3 at L�Estival Saint Germain en Laye France. Charlie Watts has announced a new show with the ABCD of boogie woogie in Paris, France, October 2 at the New Morning. 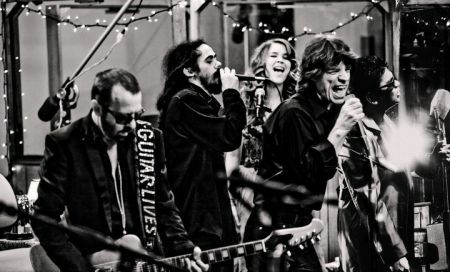 The Mick Jagger band SuperHeavy have announced their first single "Miracle Worker" to be released this week. See pre-order details by MickJagger.com and the report Mick Jagger�s SuperHeavy Supergroup Debut Next Week by Gibson.com. 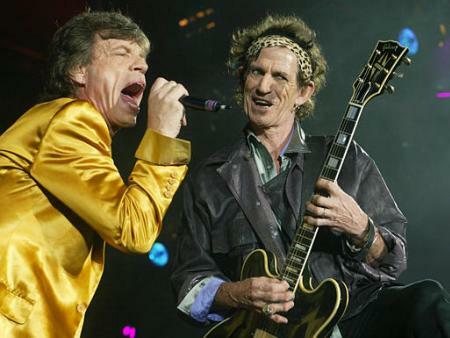 Mick Jagger has confirmed that he's formed a new group called SuperHeavy. Mick he has been rehearsing in Los Angeles with Dave Stewart, Joss Stone and Damian Marley. See Mick Jagger forms new band SuperHeavy by NME, SuperHeavy by MickJagger.com, and the IORR thread SuperHeavy with Mick Jagger. 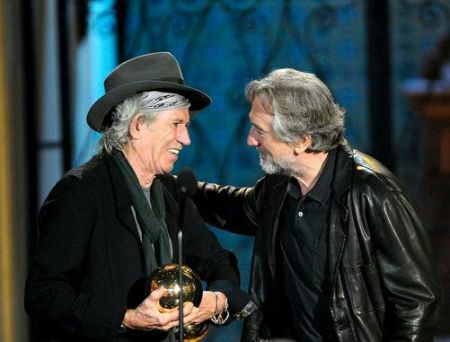 Keith Richards was awarded by Spike TV last night for his contributions to the music industry. See the press release Spike TV Honor Keith Richards. Charlie Watts has announced more live shows with the ABCD of boogie woogie, including Sept 25 at the Music Legends series, Sala de Exposiciones BBK in Bilbao, Spain and Sept 27-29 at the Blue Note in Milan, Italy. See the list of Charlie Watts shows by The Rosebud Agency. Mick Jagger has set up a new supergroup with Eurythmics star Dave Stewart, Damian Marley, Joss Stone and Indian musician and producer A.R. Rahman. See the list of Mick forms secret supergroup. Charlie Watts will be appearing with the ABCD of boogie woogie at the Jazz Club in Dean Street, London on Friday 24th and Saturday 25th June, two shows each day. See the RollingStones.com news and the Jazz Club Soho ticket details. Keith appeared as a guest on the US TV show Late Night With Jimmy Fallon yesterday. On it he explained that he had already geared up sessions with Steve Jordan for a new X-pensive Winos album. See the NME story Rolling Stones' Keith Richards reveals new album sessions and the IORR thread Keith on Jimmy Fallon Show. Wembley Stadium has announced plans to host its biggest ever battle as 25 legendary music and sporting events go head to head to be crowned the stadium�s �greatest ever�. Join in and vote for the Rolling Stones! See the official web site Wembley Stadium�s 25 Greatest Events battle for fan votes and the IORR thread Wembley Stadium�s 25 Greatest - Vote for the Stones! Fleetwood Mac's Lindsey Buckingham has covered "She Smiled Sweetly" for his new solo album "Seeds We Sow", due in the fall, IORR can report exclusively. He previously covered "I Am Waiting" on his 2006 album "Under the Skin". He warns: "It's not a keyboard song anymore, it's a guitar song of course ... I love that period of the Stones when Brian Jones was really at the top of his game and was infusing all of that experimentation into what they were doing. They lost a lot when he went away." The "Boogie 4 Stu" album will be released April 11, 2011. The album is in tribute to pianist Ian Stewart. Boogie 4 Stu was dreamt up and produced by fellow pianist Ben Waters, a member The A, B, C and D of Boogie Woogie, which also features Charlie Watts. See the IORR thread Boogie 4 Stu album details. Bill Wyman, Charlie Watts, Ronnie Wood and Mick Taylor were all on stage together as Ben Waters and his boogie woogie band did two Ian Stewart tribute shows tonight at the Ambassadors Theatre in London. See reports and photos in the IORR thread Special guests with Ben Waters in London March 9th. The Ronnie Wood gig �I Feel Like Playing � Live at the Ambassadors� will be available as a 500 copies limited edition album box set on coloured vinyl next week. See photos and details about the I Feel Like Playing Limited edition vinyl box set on RonnieWood.com. 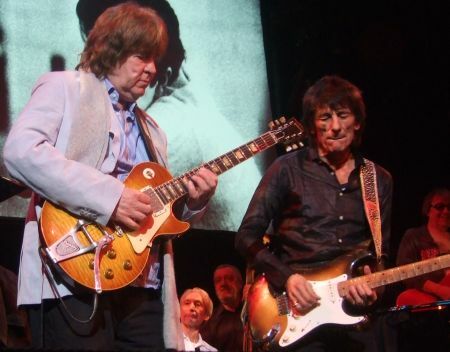 Ronnie Wood is due to perform live with The Faces in Germany this summer. See the list of shows on the Faces ticket information by GetGo.de. Mick Jagger is currently working on a new solo record with producer Dave Stewart in Los Angeles, USA. See the Billboard story Mick Jagger Working on Solo Record. Mick Jagger performed for the first time on the Grammy stage last night, singing to honor the late Solomon Burke. Mick sang "Everybody Needs Someone to Love," a 1960s song co-written and recorded by Burke before the Rolling Stones covered it. See the Reuters story Old and new stars come together at Grammy awards show and Jagger at Grammy awards by IORR. The Rolling Stones are set to release another huge boxset, this time collecting singles from the past four decades. "The Rolling Stones Singles (1971-2006)" features 45 of the Stones singles, from "Brown Sugar" in 1971 through to 2006's "Biggest Mistake", and is released on April 11. See the NME story The Rolling Stones to release huge singles boxset in April and CD Singles (1971-2006) Box Set by Universal. Ben Waters have announced he will be performing two "Boogie 4 Stu" shows at the Ambassadors Theatre in London, UK on Wednesday March 9 with Charlie Watts and very special guests. Tickets go on sale to the public Feb. 11. There will be a special pre-sale option for tickets by lunch time tomorrow Tuesday Feb 8 if you are signed up for the Ben Waters newsletter. See the IORR thread Special guests with Ben Waters in London March 9th. Charlie Watts will be performing with the ABCD of boogie woogie for the three nights April 5-7 in Barcelona, Spain at the Luz de Gas. Mick Jagger will be performing live with Raphael Saadiq and his band, as part of the telecast's annual "In Memoriam" tribute. The 53rd Annual GRAMMY Awards will take place live on Sunday, Feb. 13, 2011, at STAPLES Center in Los Angeles, will be broadcast on the CBS Television Network, and covered online at GRAMMY.com, CBS.com, and Youtube. See the RollingStones.com news entry Mick Jagger to perform live on the Grammy Awards for the first time. The Rolling Stones have today announde the following statement: "In light of recent reports surrounding the 'Breach of Contract' Court Case in America between Live Nation Entertainment and former Live Nation chairman Michael Cohl, The Rolling Stones wish to clarify their position regarding representation and touring. Following the end of the 2007 A Bigger Bang world tour, The Rolling Stones became free from any contractual arrangements or agreements with Michael Cohl. He is neither their representative nor their tour promoter. Also the Stones confirmed today they have no firm plans to tour at this time." Reading between lines this means the tour will not happen until later this year or next year, when the Rolling Stones 50th anniversary is due. See the concert industry comments - A Statement From The Rolling Stones by Pollstar, and Rolling Stones Tour: Who Will Produce, If It Happens After All? by Billboard. Ben Waters have announced he will be performing in London on the same day as he is releasing his Ian Stewart tribute album. This will indeed be the lauch day! See the Ben Waters gigs list. The Rolling Stones next world tour, originally planned to start later this year, is mentioned in a legal battle between Michael Cohl and his previous company Live Nation. See details in the Hollywood Reporter about Live Nation and Ex-Chairman Michael Cohl at War Over Rolling Stones Tour, and the IORR Tell Me forum pages. The Rolling Stones next world tour, planned to start later this year, is mentioned in a legal battle between Michael Cohl and his previous company Live Nation. See details in the Hollywood Reporter about Live Nation and Ex-Chairman Michael Cohl at War Over Rolling Stones Tour, and the IORR Tell Me forum pages. Charlie Watts will be performing with the ABCD of boogie woogie for the three nights Wed March 30, Thu March 31 and Fri April 1 in Vienna, Austria at the Theaterverein Wiener Metropol. Stern Pinnball are presenting a brand new Rolling Stones pinball machine these days. According to the pinnball.com report, the main toy of the game is a moving Mick Jagger target which travels in an arc across the centre of the playfield to block certain key shots. The aim is to hit the Mick in six places on the arc to light the corresponding musical notes. See the pinnball.com presentation Stern's latest release: The Rolling Stones. Charlie Watts will be performing with the ABCD of boogie woogie Monday March 7 at The Tivoli Theatre in Wimborne, near Bournemouth, UK, Tuesday March 15 at the St. Pauli Theatre, Hamburg, Germany, Thursday March 17 at The Brook, Southampton, UK, and Sunday April 3 at the House of Culture, Helsinki Finland. See the Ben Waters gigs list and Charlie Watts gigs by The Rosebud Agency. Ben Waters has just finished his Ian Stewart tribute album, due out March 9, 2011. The album is including the Bob Dylan track "Watching The River Flow", where all Rolling Stones members including Bill Wyman has contributed. Possible gigs to promote the album will be announced on BenWaters.com. Latest IORR news right now!